Scuba divers get to explore parts of the world that most people will never have the opportunity of seeing other than maybe in a documentary. But even divers are sometimes limited to where they can go and what they can see. 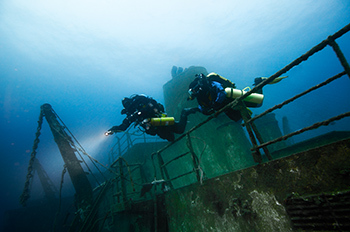 PADI TecRec courses can open up opportunities to experience new dive sites and areas beyond the recreational realm. Diving beyond 40 metres/130 feet deep. Diving in an overhead environment beyond 40 linear metres/130 linear feet of the surface. 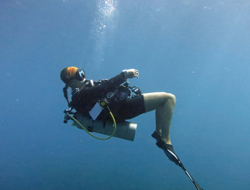 Accelerated decompression and or the use of variable gas mixtures during the dive. Now it’s important to know that technical diving can have more risks, potential hazards and shorter critical error chains than recreational scuba diving. It requires more training, discipline and equipment than recreational diving. It’s of paramount importance to ensure the proper training is undertaken before diving beyond recreational limits. So why even do it? untouched, as well as marine life that don’t live in your typical diving zone. Other people simply like the hard work and want to be challenged. For them, the more effort and planning they put into their dives, the greater the reward. So how do you get started? Divers who are interested in getting involved in technical diving can get the training and knowledge they need through PADI TecRec courses. 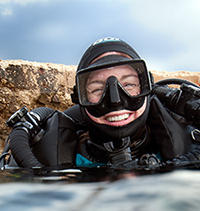 Each course level will introduce you to new gear, planning and procedures that are necessary for the diving limit. In these courses, you’ll start as a beginner, but when finished, will be a qualified PADI TecRec diver able to beyond recreational levels. To find out more about technical diving and information regarding the TecRec course, visit the PADI TecRec Section of padi.com and Locate a PADI Dive Shop today.